While in Japan and discussing design and the implications it can create around action and thought. 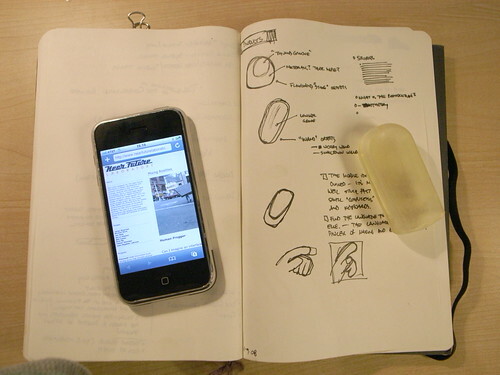 Nothing mystical, but maybe..For example, the Zero Waste charger scooting around the Design Strategic Projects studio. The design of the activation button which starts a charge cycle that is constrained by time, to account for the extra fluff in the practices around chargers. Chargers left plug in normally draw some small bit of power — around 300 milliwatts, typically — just for being plugged into the wall. Even after your phone or computer or whatever is finished charging, the charger draws some overhead power to keep itself warm and continually topping up the phone. Even if it only takes an hour or two to charge up the phone (more often than not, the battery is more than half-way charged when we plug it in to begin with) it gets left in all night. Multiply the effects of a billion chargers times 300 milliwatts and the effects are gargantuan. But it’s not just engineering redesign — changing the circuitry inside of the charger to draw zero residual power, although that’s definitely part of it, and such electronics were constructed. It’s also the designed button — an “action-implications” button. It’s a deliberate design facet meant to contribute to a subtle awareness that you are consuming power. The button has a deliberately longer than normal travel to contribute to the quiet but rich and meaningful action. The implications should be clear — this action costs something. 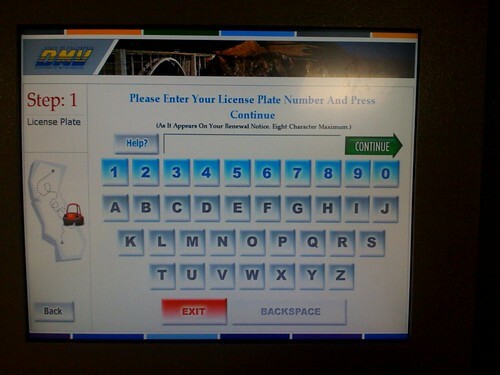 At top there, another action-implications style designed interface. 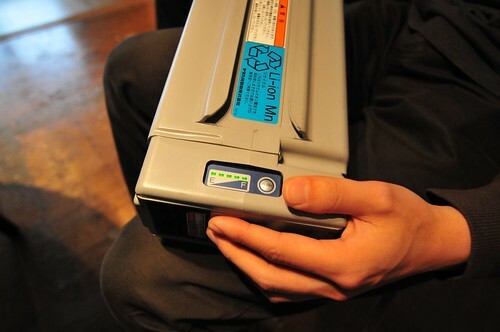 The action of pushing the charging button reminds you that these enormous batteries are starting to charge, and will stop charging once the battery is full, rather than continuing to draw residual power. Next task. Construct a house that runs on a 12 volt mains rather than 120 volts, or 220 volts. I got an instructive challenge to one of the hand-held forms I’ve been modeling. It’s a bit hard to see in white plastic, but the form is basically smaller, with some simple articulations that in my early days here, have been difficult to execute in software. 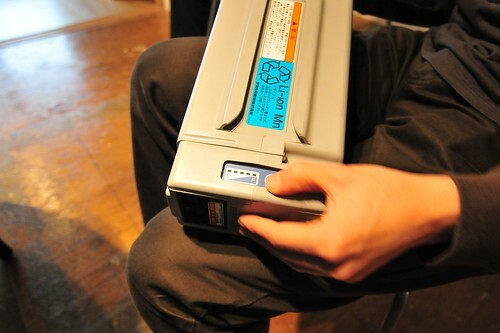 I like this form — it’s compact and smooth and feels comfortable to hold. 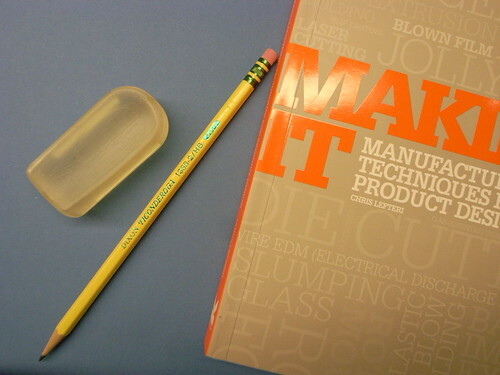 I’d like it in wood, frankly, so I’m starting to think about how to design for milling rather than for printing. Like a buffoon, I cracked the top fitting while I was trying to remove a small section of this swept guide that keeps the thing closed. I should have either sawed or filed it down. Instead, I took a pair of snips to it and, even thinking that it might break, went ahead and tried to snip it. So, that crack? With the gobs of glue? That’s that. I whipped up a small mounting package to help contain the loosey-goosey bits — the PCB could fit in clips and such, but I’m thinking that it may be easier to fit things in one “fixed” package and then allow the package to go into a variety of things that may have different geometries. There are a bunch of problems with this particular design, or challenges — mostly trying to get the light to be as ambient and non-directional (or to not appear like it’s coming from these very bright sources). The white plastic helps, but I think a lot more can be done. The shadows created by the mounting package itself is a distraction. This is a quick, quick sketch for an idea I had for a intimate personable device that is best described as a digital worry bead or Kombolói — not so much a worry bead as something to capture and diffuse your anxiety. 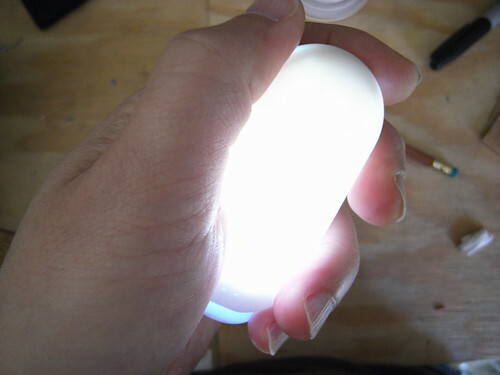 It works by capacitively linking your tension through a unique capacitive touch sensor and then harnessing that energy, turning it into light and then diffusing it into more soothing energy. It’s just an idea I had on the plane. I don’t think I was having an anxious feelings on the plane, but I thought — what would an “activated” (digital/electronic) version of the Kombolói look like? What would it do? What would it make me feel? I wanted to find a way to make it luminesce brightly. 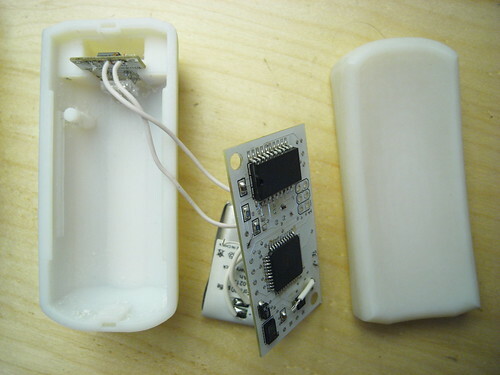 I’m still working on that — because of the fittings inside and the printed circuit board, etc. — it’s proving difficult to make it glow exceptionally bright, and without shadows. I may have to lower my expectations and change things around in some fashion. 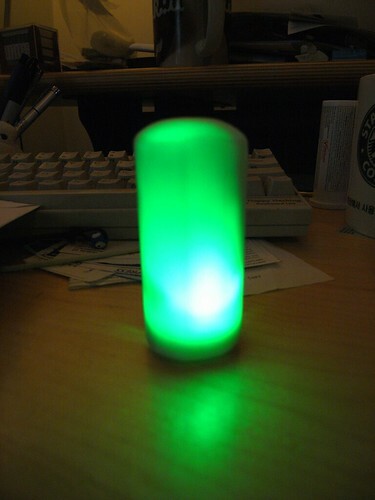 Perhaps only a small part of the object will glow. I’m also thinking about ways to make the interior reflective to bounce light around and mitigate the effects of shadows on the surface. 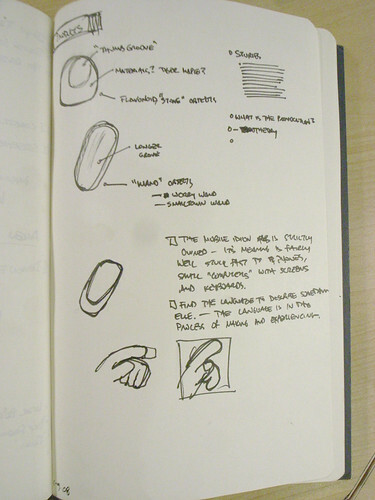 I started with a simple form for the object that was quite small, just to try it in the hand. Generally, people thought the shape and form was right in this early shape. I sort of awkwardly modeled the form in as few strokes as possible, but clearly I need to learn how to be more patient with the modeling stage of the sketch, including allowing myself multiple steps for each larger feature — sketch, revolve, cut, extrude steps, for example, for just one articulation in the form. In other words, just getting the basic overall shape and then cutting away to get more detail. I had been trying to get most of the form in one quick step, with an extrude or whatever, and not paying attention to where tangents were falling, etc. 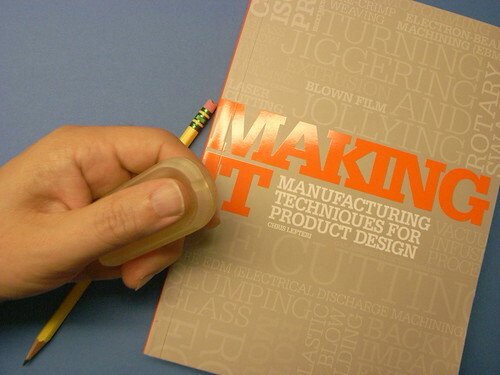 For example, when I started with this form (the small thumb-sized transparent model below) and then moved to a second version (the white plastic one above) I tried to make small improvements to account for the engineering that had to happen inside (mountings, slots, clips, etc) and ended up breaking many of the external features, and making hard points that defeated my goal of a smooth, informal form. This of course yet another mechanism through which I am exploring how Touch, Motion and Time can become the basis for experiencing different sorts of interactive experiences. My conceit is that these are elemental forms of human experience that are largely dismissed in the digital era, but they are crucial and distinct aspects of how we humans experience and make sense of the world around us. So, to understand this more completely, and to have a stronger basis for discussing it and creating new things that are more than button clicks and mouse florishes, I have been making some template components that articulate these elements in various ways. This is just one more that occurred to me a couple of weeks ago. The touch aspect of these Kombolói — that you hold them and they can be seductive enough in the hand to compel you to roll them in your palm or run your thumb along them as a gesture that soothes and calms; the motion of moving them around and such in the same fashion; and the durational aspect of them, that you spend time, slowing yourself and focusing and loosing yourself as time passes and as you begin to relax, rather than the immediate and instantaneity of many digital and networked interactions — these all seemed to be captured in this social object. So, the question is — what would be a way to explore these elements in my small catalog of devices? I made a variation of the template component I’ve been making for many months now. 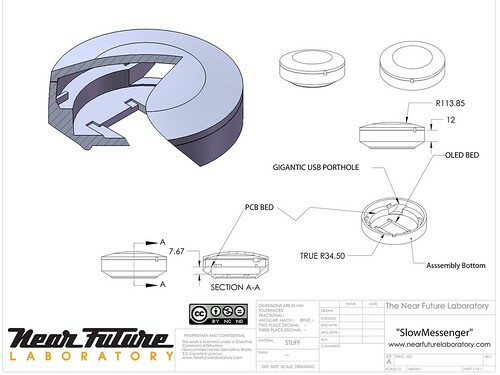 This time, I tried to find some simplifications and tweaks to change the geometry of the component. Yet again. 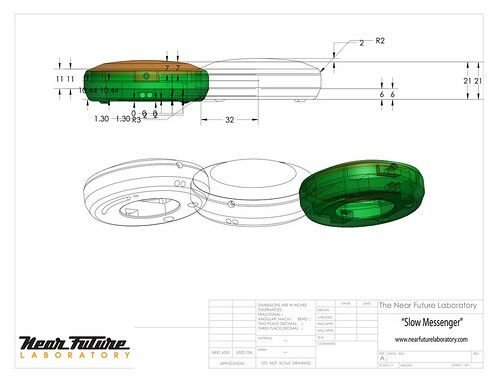 (Sigh..) The process of iterating these designs is both exhilirating and exhausting. I end up taking very similar electrical schematics and sweeping them through physical changes, moving components around in the printed circuit board to try and compress things, sourcing alternative replacement components or learning new little tradecraft tricks. I quickly redid some circuits and board layouts on the flight back and got the form factor down to a geometry that’s got one long axis and was as narrow as I could make it. I’m still trying to find easy ways to program the ATMega microcontroller without taking up a big footprint on the circuit board. Haven’t quite found the right way yet. 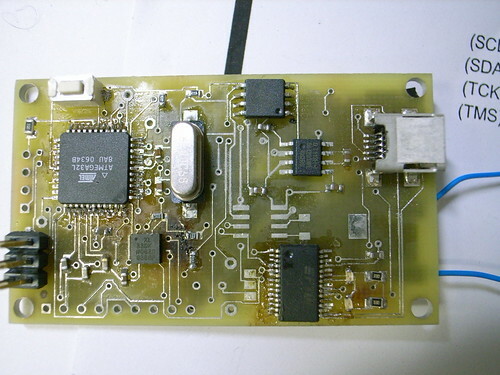 But, I’ve foregone putting the FT232RL device on the board, which was the rather large chip to do USB to serial conversions. Very convenient, but very large. 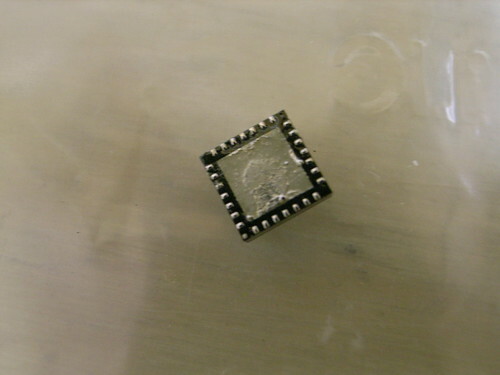 My strategy now, such as it is, is to use a small external breakout board that the FTDI people manufacture that does the same thing, only with a much smaller footprint version of that chip (one that’d be a challenge to place by hand on my board) and which includes a mini USB connector on it. So, using that breakout board, I only need to run a few wires to it, and I can put it off to the side in the device with a simple mounting bushing or slot into which it fits. The overall design is meant to be something that feels good to hold — comforting or soothing. There’s a strange anomaly with the electrical circuit that I need to figure out — it appears to drain the battery completely even when it is “off.” I have a kind of untested mechanism for shutting off power to the main logic rail (VCC) while keeping the output of the regulator powering the real-time clock’s battery backup input so that it maintains the time. Perhaps there is a problem there, although I’m a bit puzzled that this design would cause a problem. This part of the design process is less interesting to dwell on, so I won’t. Suffice it to say that there is some problem, and part of documenting the design process is to mention and ponder problems, so, well..there you go. I also had some good feedback from folks yesterday regarding some technical issues and design issues. It seems that the illumination aspect is still a bit krufty — it’s tricky to illuminate the body, particularly with the translucent material, because because of the shadows cast by the internal parts. I am going to try making some sort of light guide to help mitigate this problem — perhaps a tube or some such that runs along the long axis of the part. Jed suggested this, and it immediately made good sense. Something that caps at the LED and fits on it. Also, this provision for two LEDs — one on either end, facing towards each other — means that I can make the light guide attach to both of them along the long axis. For communication to the data network, I am thinking about a color-based semaphore system using the built-in camera that many computers come with. 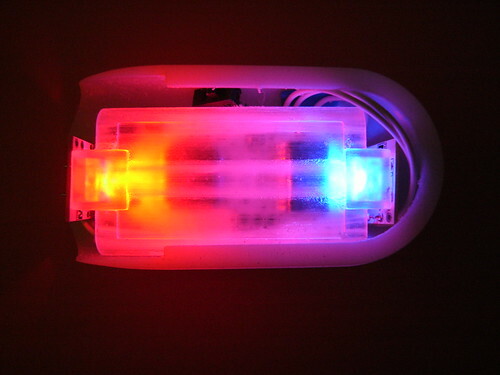 The idea is that a simple color sequence can relay certain information could encode the state of the device which could be interpreted by a simple Processing sketch or something. It wouldn’t communicate the kind of robust information that the current firmware is able to do over USB (or..maybe it could? ), but it would be a compact mechanism for doing this, and eliminate the necessity for USB hardware and so forth. I’m looking forward to exploring this further. We were discussing it in relation to Veronica Perdes class project on this very exciting idea of a "Fugitive Object" and how we could create a simple mechanism for communication back to the mothership. Slow Messenger is an instant messaging device that delivers messages exceptionally slowly. Built into the device is a messaging technology that unfolds its content based on an interface that borrows from the traditions of long-form letter writing, hand-carried mail sent through the post. 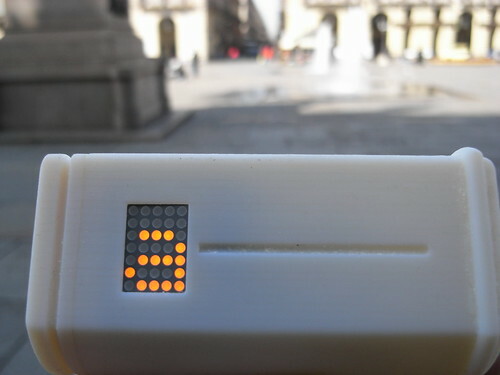 The instant messaging device connects digital information channels — such as the Internets — to physical information channels — such as streets, hands and the friction of human contact. 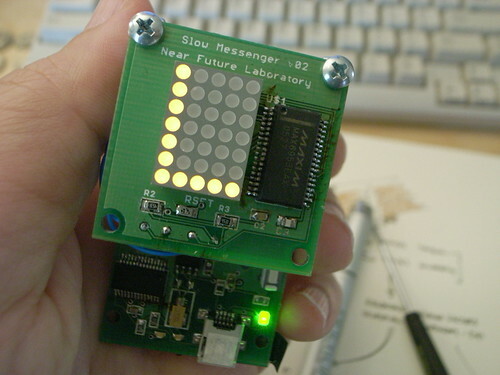 SlowMessenger works by simply receiving the message from the message sender. Once the message is received, it is gradually displayed, one letter at a time based on two factors. The first is the relative amount of time that the device is held; the second is the amount of time the device is carried while walking. These factors — holding-by-hand and walking-with — are interaction rituals key to the conveyance of intimate messages. In “another era” that is not the “digitally networked era”, “taking the air” and “perambulating” were crucial interaction rituals for maintaining and knitting together “social network” relations. Friends and intimate couples would “walk hand-in-hand” and discuss matters on their minds. In this “other era”, in times when friends were not in proximity, perhaps because one or the other was off to war or at sea, long-form “letters” were composed to substitute for physical proximity and communication. Postal mail was used to maintain communications and “stay in touch” even if “physical touch” was not, in a literal sense, a possibility. In this “digitally networked era” communications mechanics are designed to take advantage of the efficiencies of electronic networks. In this way, contact is perpetual and ubiquitous, often resulting in nearly meaningless communiques and dispatches. By “slowing down” the instantaneous message, the device saves time by allowing one to avoid inane drivel and focus on a meaningful connection to one special person. Here’s the v03 Flavonoid prototype pretty much all assembled, except for attaching a battery on back and the DS1340 real-time clock and its crystal â€” you can see the landing pad there near the center.. I’d be surprised if this all works. I mean..something must be wrong, right? Okay, everythings on there..now what? I basically try to test each component one at a time to see if it works. Here I’m checking the QT113H, which is a touch/proximity sensor. The sensor can detect whether the Flavonoid is being held, or is near your body. Touch/proximity interface semantics are something I’m interested in experimenting with â€” more than just physical contact, but nearness as well. What I’m doing is checking to see if the sensoris working. My finger is over a contact to which will be attached a flexible probe, like a super thin wire that can be run along the inside of whatever enclosure this ends up in. 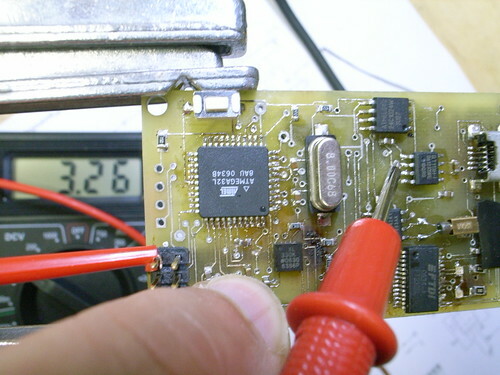 So, it triggered â€” I can tell because my multimeter went to about 3.3v. But, then something annoying happened..it basically locked up, the sensor. And then I remembered that when I was first experimenting with the QT113H, it had to be recalibrated, basically by cycling the power. I never really fully understood when that had to be done, but regardless â€” this is a problem because, well..Flavonoid has no power switch so I can’t cycle the power on the thing, even for debugging. Drat.. I threw a tri-color LED on there for debugging and diagnostics. I think I’ll probably put a surface-mount one on there in the next version. 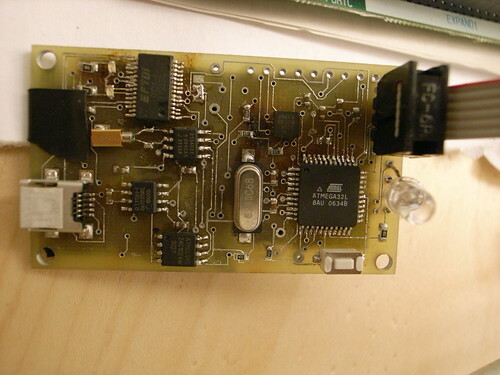 I put an in-system programmer jack on the board so I could program it with just about any in-system programing jig. That ribbon cable there is running to my STK500 on my Windows machine, although one of these days I guess I’ll figure out how to use the rig I got for my Mac. Anyway, I use AVRStudio’s little AVR programming interface to flash the program memory from the STK500. I comple using the WinAVR (avr-gcc) tools, which works like a charm..no problems. Okay, back to this snafu with the QT113H..basically it turns out that you can “power” the thing directly from an I/O pin on the microcontroller. 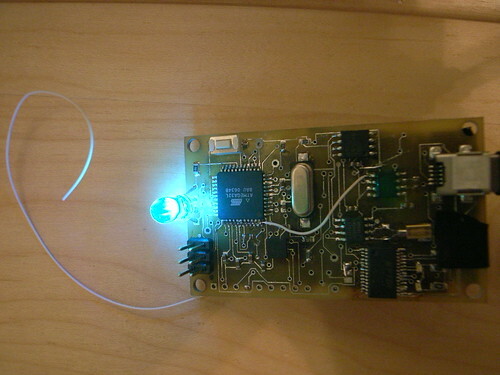 It uses so little current to run, that one of the pins on the ATmega32 can supply it. So, that means I can connect the power pin of the QT113H directly to one of the port pins, which I did here with a little light gauge white wire wrap. 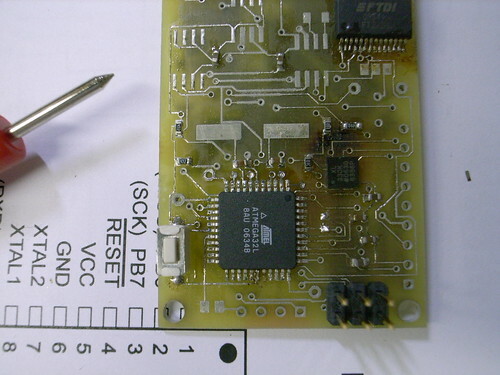 I had to cut a trace on the board that had been the VCC supply for the QT113H. Easy peasy. Now i can power the thing up and down programmatically. So, every reset or whenever. Convenient. 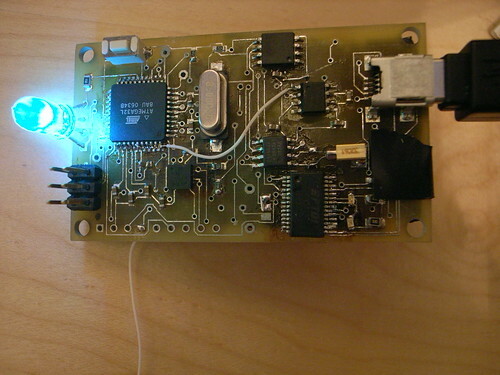 Here I attached a little bit of white wire as the sensor probe for the QT113H. Works like a charm. If I hold my hand near it, it triggers the sensor. 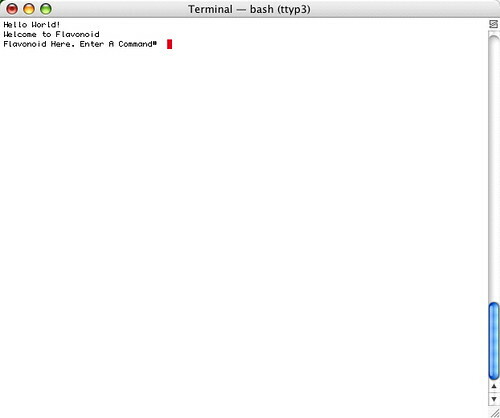 That’s it — proximity sensor works. Did a little redesign in the original schematic. 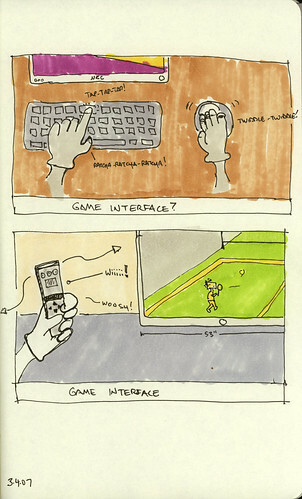 Next, I’ll check to see if the real-time clock is working..
Game Week Musings — Offline Gaming? A Near Future for Electronic Play? Trying to come up with some “log line” style idioms to describe the whole vector of near future research I’m doing around game gestures that elongate the scales of motion, time and contact (proximity, touch, etc.) that electronic games have completely shrunk down to nil. There’s definitely a trend towards considering stretching these out a bit — the Wii, Warioware, Teku Teku Angel, Nike+, MobZombies. How far can you go? Can there be “offline gaming” where the screen disappears to the point of it not even being necessary? 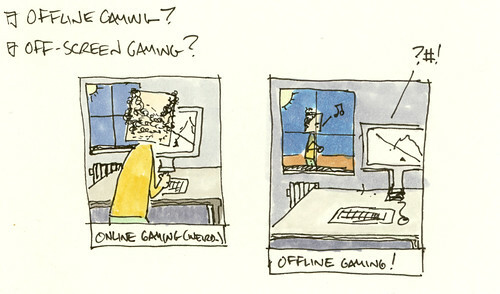 Where you sort of ambiently know that you’re gaming in the sense that your actions and activities “offline” will register in the game world once you get back to your normal human computer later? Can you still be gaming while you’re doing a run to the market, without being consciously and actively “in” the game while doing the grocery shop? But still, knowing in the back of your mind that, hey, cool! I’ll get my shopping done and probably get a +2 power up! What’s the language and name for something like that? How far can you go with a game gesture? Can shopping at the Farmer’s Market become an interface to an offline game, such that my action and activity while shopping powers-up my electronic game avatar while I’m away from it? Is our imagination open to the idea of gaming..even while not in front of a screen? Can you keep it in the back of your head that “stuff” in the online game world will be affected by your activities in the offline world? 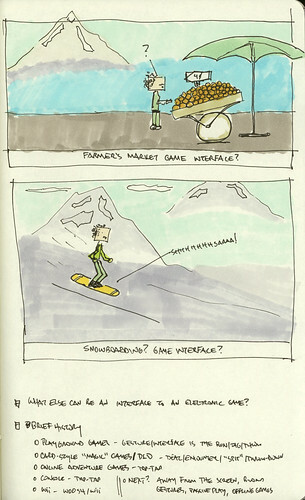 How will that change our perception of activities offline? How will it affect our attention to what’s actually happening around us? What will it feel like to know you’re gaming even though you’re not twiddling keys on your mobile phone, nor looking at its little postage stamp screen? How about this — you’re not even networked! Everything is stored up and then uploaded to the mothership later, when you’re back home ready to be an online agent again. You get to participate in what’s going on in 1st life, all the while knowing in the back of your head that your actions get to become something valuable in 2nd life! The last couple of months has been an investigation of what this could be, through a mix of mostly technology craftwork with the Flavonoid project. 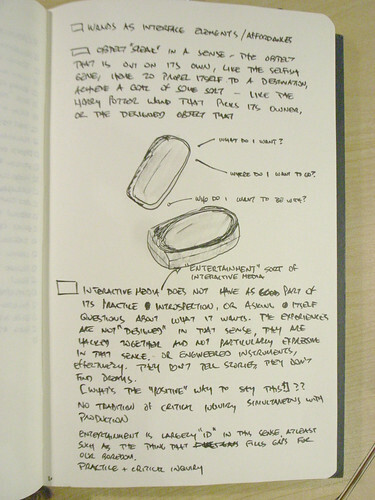 Some notes, scribblings and sketches, too, but mostly construction of a theory object that I hope will help me answer these questions perhaps more expediently than head-scratching alone. We’ll see how it goes. Flavonoid came to life yesterday, so that’s promising! Posted on March 7, 2007 August 18, 2017 Author JulianCategories Book Stuff, Flavonoid, Innovation, Motion, Time, TouchTags New Interaction Rituals, Theory Object3 Comments on Game Week Musings — Offline Gaming? A Near Future for Electronic Play? 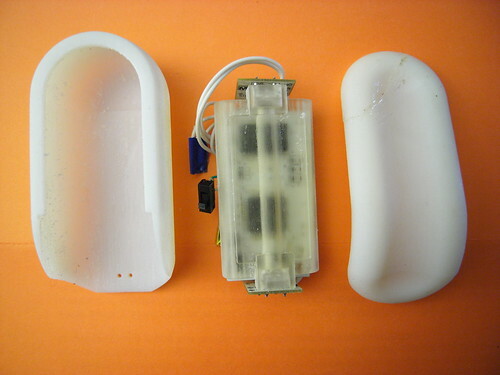 These are some images documenting one of the first Flavonoid prototype designs. 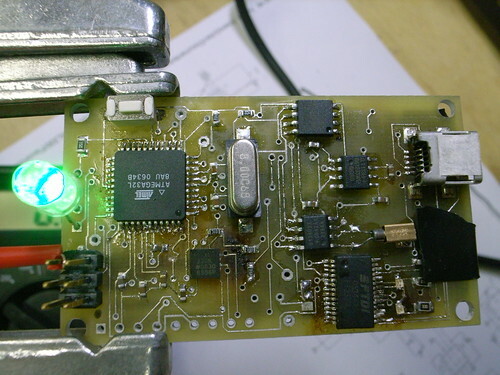 During this process, I was learning how to turn the schematic design for the project — the “logical” description that shows circuit connections and components — into materialized printed circuit boards. As part of that process, I sent the PCB designs to two different board manufacturers, a process I document here. 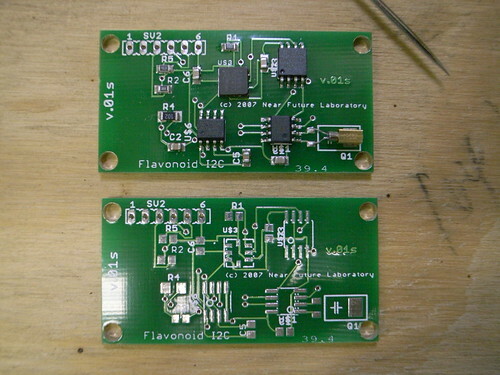 The boards are named v.01 and v.02sfe to designate the two places I sent the boards. Both are the same design. The designs were also ones wwhere I didn’t want too much happening, or too much to inevitably debug on one board. So, I left the microcontroller off. 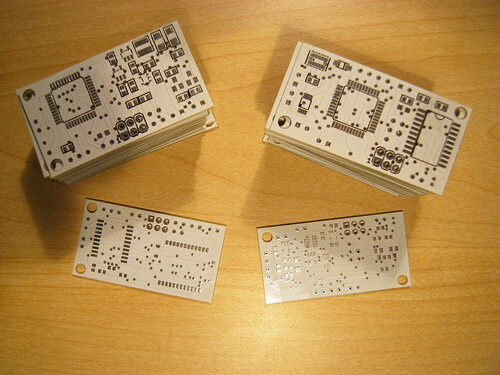 In essence, these are “dumb” boards — they require a microcontroller to be connected to them to do anything useful. In subsequent versions, I was less timid and put everything on one small board, as it should be. 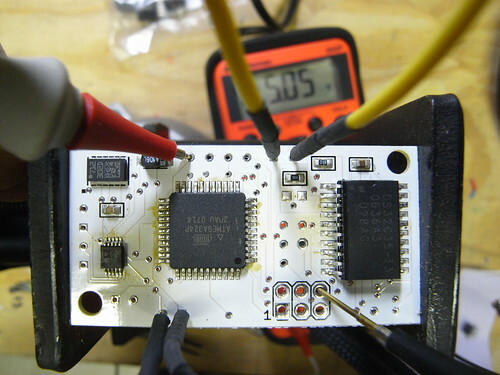 What this board does, and why it’s here in this post, is record time, physical motion and touch using a DS1306 real-time clock, an LIS3LV02DQ 3-axis accelerometer, and a QT113 capacitive touch sensor. * Time, motion and touch or contact are three semantic elements that the Internets claim to diminish, but do so for our own good. For instance, for the good of allowing us to instantly communicate with friends, work colleagues or family. For the good of allowing us to work from home, or get something to someone else without having to physically move, or physically move material or ship a document. Or for the good of mitigating against the necessity of face-to-face contact. There must be a balance between instant (messaging, downloads) and slow (mail, reflection) time scales. Or between largely sedentary digital activities (heads-down, screen-lock, sofa gaming) and embodied kinesthetic activities, like the things we do to “get away” from the screen — walk, sport, stretch. Or between mediated contact and physical touch? What would a world be like if things weren’t quite “instant”, but used elongated time as an interaction element? How could our own physical motion create a mechanical interface between the physical and digital worlds — beyond mouse movements or finger twitches and closer to Wii-gestures? What are the ways in which time, motion and touch be used to create a meaningful bridge between 1st life (physical) and 2nd life (digital)? 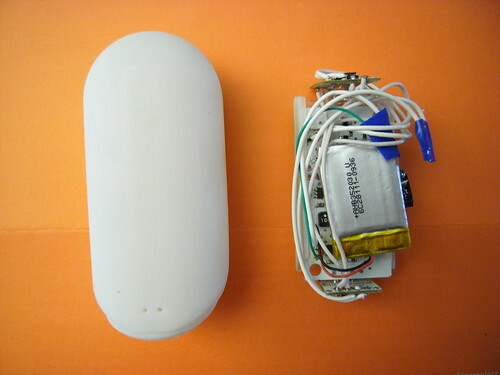 I started designing and building these sensors devices to simultaneously accumulate time, motion and touch to experiment with ways in which these idioms might be used to express some sort of online, digital, 2nd life activity. I’ve called them “Flavonoid”, mostly because I liked the way the word sounds and its fun to hear people say it in a questioning way. They’re designed to be small, something that you carry with you all the time, like a cell phone or such. The firmware being created stretches out the dimensions of time, motion and touch so they deliberately “slow” down any accumulation of data â€” they won’t be “expressive” (have effects) for quickly-done activity. Time is not quick, but ponderous, relatively speaking, so that hour have meaning, but seconds can’t be measured. They’re positively glacial objects in the era of instant messaging, digital switches and network data caches. And these three semantic idioms — time, motion, touch — work together, not separately. More expressive outputs come from these three idioms when they are integrated together. Time alone (without touch or movement) means something different than time with the object near one’s body. Motion for a brief time, alone, means barely anything, whereas sustained motion while holding the object or having it in one’s pack, has richer semantics. The interaction semantics I’m angling at is this idea of creating an application syntax based on establishing a sense of Durable Affinity between a person, a lively designed object, and the expression in a digital, online form that these two can create through time, motion and touch based activity. At the next level of design, they won’t look like they need a Homeland Security clearance certificate. To start figuring out why I’m spending so much time building these sensor amalgams devices.